I have spent time in Berlin and other German towns and cities over the years, and I have a huge regret. I must admit to feeling a bit silly, but here it is: I regret not watching the Viktoriapark cyclo cross race held in Berlin. My image of Berlin was built on cold war film dramas (Ipcress File etc. ), with an honourable mention of the ‘Third Man’, although that is set in Vienna, and the musical Cabaret based upon Christopher Isherwood’s book ‘Goodbye to Berlin’. There was also Wim Wenders film ‘Wings of Desire’ (1987) filmed in Berlin and this struck a chord with me of how I saw the city at that time – full of ghosts. I went looking for Angels. I first visited German in the 1980’s when I cycled from London to Paderborn via Harwich and landed at Hook van Holland after a ferry crossing. My journey saw me cross borders, at a German border point I actually stopped and talked to the guards as I wanted directions. They handed me the keys to the post and I used their toilet. Kindly they gave me a cold drink and a sandwich. Dressed not in cycling garb seemed to appeal to the German people – in one village when I sat for a rest, a little old lady kindly offered me cash – ‘nine, nicht, not, no,’ I uttered in desperate Anglo- Deutsch. Looking back I have a clear memory of asking a one legged man ‘vheer ist the campenplatz’? – He replied, saying none were nearby, but offered me his son’s bed who was away. We spent the evening talking in English about bikes and his time as a prisoner of war in Canada. Riding through the urban sprawl that is Dortmund, Essen and Dusseldorf was a challenge not because of traffic, as there were plenty of cycle lanes but just because it meant kilometre after kilometre of the built environment. Later I found out that the area has surprisingly some of the largest areas of green space for a city in Europe (or worldwide). At the Rhine I went for a paddle in my cycle shoes, which I still have, keeping them on because I was a little afraid that because of swollen feet, I would not be able to put them back on. In the British Army of the Rhine garrison town of Paderborn I continued my journey in a red Volkswagen Beetle. So German – the sound of a nation as the engine slung off the back vibrated madly. 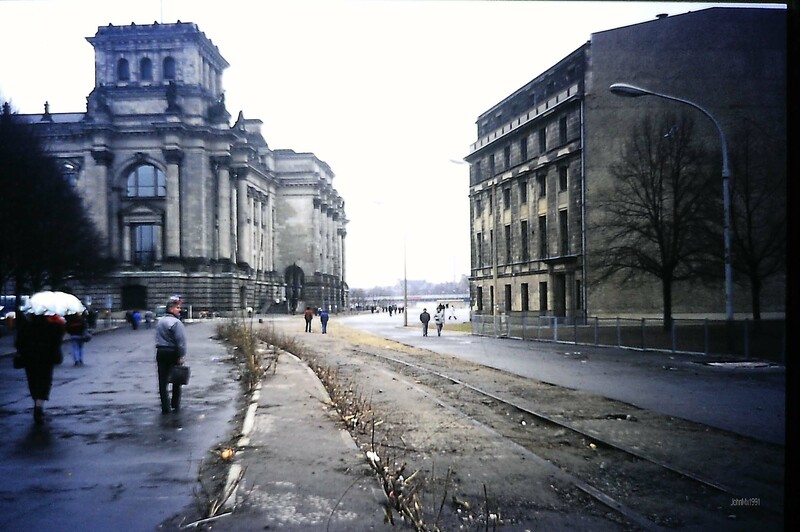 West Berlin of the late 1980’s and early 90’s was a wonderful mystery to me – a walled city at the tip of what might be Armageddon at any time – forsaken by most institutions such as finance, central government and all the political machinery of state was located away across West Germany. Some industry remained, BMW continued to make motor bikes there and the Springer publishing empire sited their HQ building right up against the wall to annoy the ‘communists’ by shining a bright illuminated sign into the East. I have a motley collection of souvenirs – and books: ‘The Wall Jumper’, ‘Goodbye to Berlin’, ‘Berlin Zo’o, cartoon books of Gerhard Seyfried and history books such as Norman Gelb’s ‘Berlin Wall’ plus the huge tome that is the ‘Fall of Berlin’. In addition I have a full Russian Artillery officer’s uniform, a Mauer Music vinyl LP, and genuine bits of the wall, cocktail sticks from the TV tower, a snow dome containing black snow, a model Trabi, a real Trabi at one point and a toilet roll cover from the parcel shelf of a Trabant. One of my earliest trips there coincided with a Warsaw Pact meeting that set the agenda for the future of the pact, Soviet Party Chairman Mikhail Gorbachev outlined that the Soviet Union would not prevent change in the Iron Curtain countries with the barrel of a Red Army tank. As this began to sink in across the Warsaw Pact I was in a rotating restaurant at the top of the of the East Berlin TV tower taking a 360 degree look across and out of the DDR (German Democratic Republic) toward the west. I ate the best thing on the menu which was Toast Hawaii (ham and pineapple on toast), in the company of an assortment of Soviet officers and other tourists. Earlier in the day I had looked at East German suits priced at 30 east marks (approx… £5) which seemed to be made out of wood chips, at the Centrum department store in Alexander Platz, situated close to Karl Marx Platz. We also viewed the DDR goose-stepping guard of honour at the monument to anti-fascism. Much of what the DDR produced was sold to the west to get dollars or west marks and so the cream on offer in shops was always ‘Ersatz’ (including cakes). One import I did see was in the Prenzlauer district where a row of Colnago cycles were lined up within a bike shop bedecked in Soviet and East German team jerseys and skin suits – being an idiot cycle mad tourist I tried to talk with the staff but they just sniffed at me. After the wall fell I returned to the shop to find it the same with the same attitude of distain, but now featuring a row of Treks and not a Colnago in sight. Crossing the border between East and West featured the soul sucking drabness of the checkpoint buildings, a sense of bored municipality prevailed and in particular small windows obscured by faded floral pattern curtains with a further thick layer of net curtains – net curtains being a byword for Soviet type state buildings – and dark corners inhabited by AK47 toting guards. I just smiled at everyone and made it clear that I was listening respectfully at whatever they said even if I had no idea of what it was. I was told that soldiers from the British Highland regiments would often smuggle Meissen ceramics and whiskey from the East under their kilts, as they were exempt from search. I was once on an S-Bahn train and when we hit the first station on the West side I observed my fellow passengers dropping smuggled goods such as cigarettes brought in the East onto the floor – West Berlin customs having boarded earlier. Each day I spent in the East would end at midnight when my day pass ended – at Friedrichstrasse station you couldn’t help but note the regret of some who were forced apart at night at the border check point. The wall was a mean nasty divide that caused death and heart break and simply cemented a totalitarian mind-set. Maybe a more enlightened one might have allowed the East Germans to develop their vision of a ‘workers’ paradise’, but any chance of that was stifled into submission. Outside of Berlin East Germany was a sleepy place where roads destroyed western cars – especially when the wall fell and East German’s bought knackered vehicles from dodgy Western car sellers – where also Russian soldiers lived in barracks with holes in the roofs and the pollution of the soil and sky was common-place. Now these areas are open and not fully developed, although you will find many a remnant of the Nazi fetish (and co-opted by the Russians) for concrete in the woods and undergrowth. Although the East received special funding paid for by a ‘solidarity tax’, the standard of living in general remains lower and right wing views are most prevalent here. First the extreme left were popular and now the right is on the ascendency as the area continues to find its place in Germany. I prowled the wall when it still stood, checking out its nooks and crannies including the western enclaves that were once accessed by a barbed wire lined path and before agreement children walked to school escorted by British, French or US armoured cars. It was an environment where the military was everywhere; British Military Police patrolled the Kurfuerstendamm and dealt with unruly western soldiers as local police looked on, knowing their place. Escape for West Berlin citizen and soldiers from the city was the over ground S-Bahn train straight out to the Wannsee and the Grunewald passing by the Avus motor racing circuit, now an ordinary motorway, that lies adjacent to the train line (look out for a still standing grandstand). The Wansee and Grunewald is an area of forest and lakes– sprinkled with castles and trails and sandy beaches (popular with nudists), It was a popular spot for Nazis also and they planned much of the ‘final solution’ here, but for the West Berliners and western soldiers it was and is a release from the urban landscape. Such was its popularity that Berlin had the highest number of registered boat owners anywhere in Europe and maybe the World. Many a cyclist and club can be found any day of the week taking to the paths and trails of this jewel in the Berlin landscape. I went paddling but never had a bike to ride. Before 2014 when the Germans hosted the World Cup you could freely explore the 1936 Olympic Stadium and sit where Adolf Hitler sat, but now it is in organised groups only and much of the brutalist Nazism of the complex has been softened and now feels corporate, maybe this a parable for modern Germany post the fall of the Berlin Wall? The Viktoriapark and monument, dedicated by King Frederick William III of Prussia to the Napoleonic Wars, overlooks the Kreuzberg area of Berlin and is one of the few natural elevated spots in the city, many of the others being made from the rubble of Berlin’s complete destruction in the Second World War. Kreuzberg, when the wall stood, was the place to be if you felt that West Germany was sophorific or bourgeois and the east Stalinist. Kreuzberg was inhabited by the working class, Turkish guest workers, draft dodgers, hippies, counter culture followers, agit-propers, politicos, squatters and people who simply enjoyed the alternative feel of the area. On the Eastern side of the internal border people were separated from the wall by a wide death strip whilst in the West people lived right up to it and this was a feature of Kreuzberg. Housing would be just across a street having been split apart by the border, and the wall itself became a canvas for art and the expression of beliefs. In my visits I have explored art galleries, the wall, places of interest, parks, bike shops, night life (yes, even clubs) and have pedalled a bike. I do regret not being able to watch the Park Cyclo Cross held in Viktoriapark overlooking Kreuzberg and not far from Tempelhof Airport. I saw the poster but I was homeward bound back to London when it was held. The Internationale Schultheiss-Cup was held in Viktoriapark for many years featuring top stars such as Erwin Vervecken and Mario de Clercq, but it has not been held since 2006, although it may have been revived as a cyclo cross event for the 2016 Berlin Bike Show – a week of cycle related events held in the city. I have a strong feeling that I have missed my opportunity to watch this event. I first visited Berlin in 1980’s and it was a place full of mystique, history and being nestled so deep within the Soviet Bloc it was surreal in so many ways. Travelling from West Germany you passed plinth mounted T34 Tanks that acted as sentinels as well as a reminder of the Soviet blood spilt in the defeat of the Nazis. They also symbolically protected their client utopian German state. From the moment you left West Germany and drove along the corridors allowed, you felt a change, at an East German service stop on the motorway we as Westerners would sit apart from the locals, eat red cabbage and brave the East German toilet attendants, these were tough women who ran their domain with an iron grip and would follow you into the toilet and look at your every nuance with suspicion. More tough women could be found in West Berlin, the city featured a noticeable large number of single older women. These women had survived the fall of Berlin, had been part of the rebuilding of it, had lost their menfolk and knew how to use their ‘elbows’ – both verbally and physically. They were infamous for taking no prisoners and when I instinctively began to stand to let one such woman sit down on a busy bus – regardless she ambushed me on my rise with a loud ‘tut’ and a firm push. Berlin after the wall felt like a place in transition and already work had begun to remedy the neglect and wear and tear on the East Berlin infrastructure, but most of all I remember the large sandy open bombsites such as around the Axel Springer Building which was yet to meet its fate at the hands of planners and developers. Potsdamer Platz, once the heart and soul of pre-World War two German was a barren death strip in 1987 and now in 2018 it feels like it could be anywhere in the world – being corperate in nature. The ‘Mauer’ clearly denoted West Berlin as an enclave deep within East Germany. The Grenze or Internal Border beyond the city cut through Germany regardless of the terrain running from the Baltic Sea to the then Czechoslovakia, some 1,393 kilometres in length. It was marked on the west side by posts painted red, yellow and black with additional warning notices. Just beyond the posts there was the first East German fence, then the death strip and another fence looked over by watch towers. Estimates put the number of people who died at the border at a thousand. In the mid-eighties I stood on the west side of the Grenze situated half way up the Wurmberg Mountain in the Harz, a region of mountains rich in folklore set in central Germany. Above my head and to the back of me was a ski jump opened in 1921 (recently demolished) that pointed out toward the East and the grenze. There was just enough space for the jumpers to glide to earth without jumping the border. It felt odd, very odd. I said this to a West German border patrol that came along and I and they looked across the fencing at men who looked back at us. The roads that serviced both sides of the Inner Border remain and in Berlin and Germany there is a general acceptance that the strip should remain ‘green’, although there is pressure to develop parts of it. Many sections have been bought up by municipal authorities etc. to protect the flora, fauna and wildlife that flourished there. In 2004 the German parliament voted to protect the ‘green belt’ linking together over one hundred national parks. Many grenze museums can be found along its length although most of the infrastructure has been removed it is ‘fun’ to discover a redundant watch tower or signage in the undergrowth. At Braunschweig a lorry park now sits on what was a motorway checkpoint and many of the buildings remain almost are as they were when I first visited in the 1980’s. It is on these roads used by the East German Army (NVA) that the annual Grenzesteintrophy is held this is a self-supported cycle event that travels the border. I have heard fearful stories of riding the Kolonnenweg, where slots set in the concrete rattle you senseless to an extreme, but can disappear in an instant sending you flying. The prologue of the Grenzesteintrophy is a lap of Berlin tracing the wall where it once stood. One thing is for sure although the Grenzsteintrophy is way beyond me now I am looking forward to riding sections of the old internal border of Germany especially in the Harz Mountains and in Berlin.